Nagios is a very powerful monitoring solution that can be used to monitor the status of hosts and servers. This post is going to cover a basic setup of Nagios under Gentoo and configuring it to monitor the status of remote hosts. media-libs/gd jpeg png # You may need this line as well if your GD isn't already compiled with jpeg and png support. APACHE2_OPTS="-D DEFAULT_VHOST -D INFO -D SSL -D SSL_DEFAULT_VHOST -D LANGUAGE -D SECURITY -D PHP5 -D STATUS -D INFO -D NAGIOS"
Now nagios should be configured and monitoring localhost with a number of checks, to check its working simply vist http://yourdomain.com/nagios/ and click the service details link on the menu providing everything is working you should see some service details and other status details about the localhost. 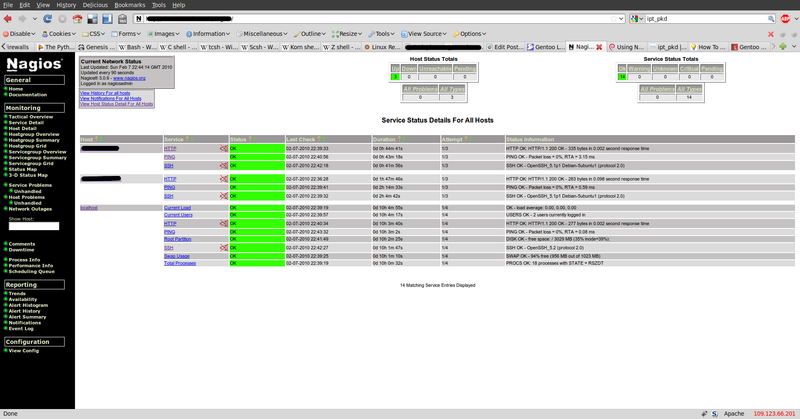 Providing everything went well we can now start monitoring some hosts remotely. There are many ways of doing so with Nagios I will cover some of these in a later tutorial but for now I will simply explain how to set up a check for PING, SSH and HTTP against a host. Edit the /etc/nagios/nagios.cfg file and add this line any where below the log_file line. next you need to create the dir /etc/nagios/servers and set it to be owned by nagios. now create a new .cfg named yourdomain.com.cfg and begin editing it. Add the following to the file save and exit. finally visit http://yourdomain.com/nagios/ click on the service details link again and you should see all your servers with status reports for the PING, HTTP and SSH monitoring. Thats it for now any problems or questsions let me know I plan on covering the subject in more detail in a future post. Fail2Ban’s primary function is to block selected IP addresses that may belong to hosts that are trying to breach the system’s security. It determines the hosts to be blocked by monitoring log files (usually /var/log/auth.log) and bans any host IP that makes too many login attempts or performs any other unwanted action within a time frame defined by the administrator. In most cases people use it to limit the number of login attempts that are allowed against SSH within a period of time, this can make it very difficult for an attacker to brute for a login. after these initial steps have been completed if your running not running Ubuntu 9.04 you can skip the next section, unless your seeing Unexpected communication errors in the /var/log/fail2ban.log file. Now that fail2ban is installed and working the next step is to configure it for your needs the following is an example /etc/fail2ban/jail.local file which has been configured for protecting SSH. Settings in jail.local will override the ones in jail.conf this is an example where all of the jails have been removed except the one for SSH. # Fail2Ban local configuration file. ignoreip = 127.0.0.1 111.111.111.111 # Here you want to ignore IP's such as the IP of the Server its self, your IP and any other IPs that its important are not locked out.